Approximately 29% of U.S. energy consumption is used for transportation, with 58% of that consumed in light-duty vehicles (cars, light trucks, and motorcycles). In 2017, 91% of U.S. transportation energy came from petroleum, nearly half from foreign sources. Moreover, average light-duty vehicle fuel economy has plateaued over the last 30 years. Improved engine technologies and powertrain systems can enable more efficient and cleaner vehicles, which can substantially reduce U.S. oil imports, increase the energy efficiency of transportation, and mitigate greenhouse gas (GHG) emissions. Although vehicle original equipment manufacturers (OEMs) are investigating various technologies to improve efficiency, increased costs present challenges. Blending innovations to both the hardware architecture and combustion strategies has the potential to increase efficiency and reduce emissions, while satisfying the cost and performance expectations. A high-performing engine embodies two well-coordinated design aspects: hardware architecture and combustion strategy. The incumbent technology for light-duty vehicles is the four-stroke spark-ignition engine. A paradigm shift away from the spark ignition strategy towards completely changing the four-stroke architecture could yield transformational gains. On the combustion side, gasoline compression ignition (GCI) has garnered significant attention from OEMs and automotive Tier-1 suppliers in the last few years. 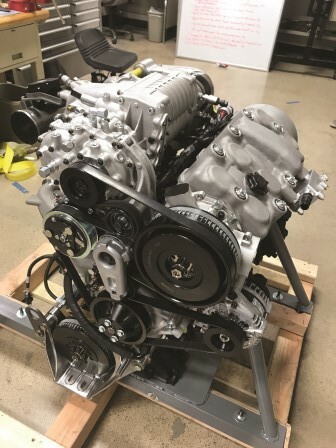 GCI exploits the high-efficiency benefits of a compression ignition engine,a characteristic of diesel engines, while utilizing gasoline or gasoline-like fuels to reduce emissions. However, significant challenges remain to unleash the full benefits of GCI, such as low load and low temperature combustion stability and high load combustion noise and high cylinder pressure. On the hardware side, the opposed-piston (OP) engine design offers significant efficiency benefits over the four-stroke architecture by reducing heat transfer and eliminating the valve train. Intake ports and exhaust ports are opened by piston location, enabling effective uniflow air scavenging necessary for efficient two-stroke engine operation and replacing the complex poppet valves and valve trains of traditional engines. The OP engine’s lower heat loss and decoupling of piston motion from air induction provides thermally favorable ignition conditions for GCI, minimizing low load combustion variability, while the two-stroke operation reduces the high load combustion noise and cylinder pressure challenges. The flexibility in controlling the combustion conditions and fuel injection strategy through multiple injectors per cylinder solves some of the hurdles that the four-stroke engine has in delivering GCI. Compression ignition OP engines are inherently more efficient than conventional gasoline spark-ignited four-stroke engines, with potential for up to 50% higher thermal efficiency, while providing comparable power and torque. They also show the potential to meet future tailpipe emissions standards. Early experiments performed in a single-cylinder research engine at ANL at low- and medium-loads indicate thermal efficiencies between 45-50% for the OP-GCI technology. The project team has performed extensive cost analysis that projects the OP-GCI technology will cost less than current technology trajectories for the year 2025 and beyond, when OP-GCI engines could significantly penetrate the light-duty and heavy-duty engine markets. The OP-GCI engine has generated interest from defense, automotive, marine, and oil and gas industries. Among its follow-on investors, the Oil and Gas Climate Initiative (OGCI), a CEO-led initiative of 10 oil and gas companies, has funded Achates Power to accelerate development and commercialization. Achates Power is working with a leading automotive engineering service provider to build a light-duty pickup truck demonstrator vehicle, a version of which showcased at the North American International Auto Show in January 2018. The OP-GCI technology shows a 30%-50% efficiency improvement over current gasoline engines without increasing cost relative to conventional engines. Such improvements will result in significant energy savings and emissions reductions. When integrated with current vehicle hybridization technologies, the OP-GCI powertrain could be the most efficient, liquid-fuel driven powertrain. The suite of technologies developed in this project could also have far-ranging impact beyond the transportation industry, such as in power generation, oil and gas, and marine industries. As of November 2017, the Achates Power project has generated eight invention disclosures to ARPA-E. Compression ignition engines compress air to a much greater degree than spark ignition engines. The higher compression ratio leads to higher efficiency from the engine and improved fuel economy. The fourth generation Toyota Prius 1.8-liter engine achieves a peak brake thermal efficiency of 40% (http://toyotanews.pressroom.toyota.com/releases/2016+toyota+prius+techno...), which is notionally considered as the yardstick for light-duty engines.